RELAX & ENJOY AT AUSSIE RESORT! Situated just a short leisurely stroll from the beach, Aussie Resort is perfect for anyone looking for a relaxing seaside break. With a selection of self contained one bedroom apartments, an inviting heated pool and tropical barbecue area, everything is in place for your best Gold Coast getaway yet. 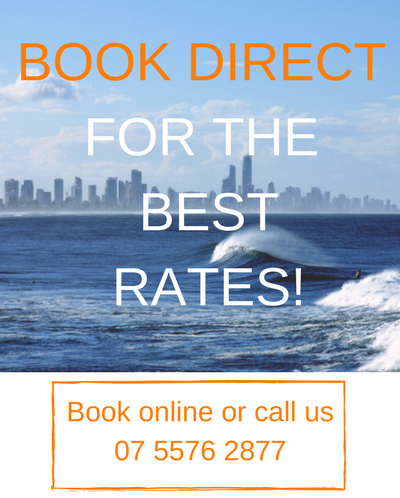 When it’s time to explore, Burleigh Heads National Park, Surfers Paradise and the region’s world famous theme parks are right at your fingertips at our holiday apartments Burleigh Beach. Burleigh Heads beach is recognised by tripadvisor as the “best beach” in Australia – and it's just a couple of minutes walk from Aussie Resort. Walk down to Mowbray Park and Burleigh headland where every evening, thousands of rainbow lorikeets gather to create a show to behold. On weekends, you can experience the local food and fashion markets or enjoy an evening of bohemian fire dancing and drumming. For keen golfers, there are 10 golf courses within 20 minutes of the resort.